I know I said I was going to move on to another force, but I wanted to clear my painting table before starting anything new. I had an Tiralleurs Machine-gun platoon nearly finished, and those four trucks and inserts were just asking to be knocked out really quick. So, I spent the last few days of my holidays dusting off these platoons and getting ready for the next project. I've also included my Tiralleurs Artillery Battery, which I finished a while ago, but haven't posted up yet. So in going with this theme of gun teams, I thought I'd write up a little bit about the guns in Leclerc's column. Leclerc left Chad to attack Kufra with few heavy weapons. This was mainly due to the fact that guns were difficult to transport across the Sahara, but also because the colonies of French Equitorial Africa were not terribly well supplied with military weapons when the war broke out. Like many colonies, the French troops in Chad had to fight a modern war with the previous era's weapons. 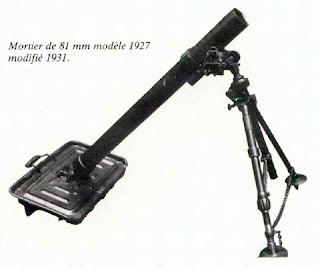 Many of the weapons, such as the 8mm mle 1914 heavy machine-gun, were from the First World War, while others, such as the 75mm mle 1928 was a inter-war design. Basically, Leclerc had to deal with what he had and could not rely on more modern equipment. Leclerc's column consisted of four artillery pieces: two 81mm mle 27/31 mortars and two 75mm mle 1928 mountain guns. These were critical to success as they constituted some of the few weapons in the Sahara that could fire high explosive ammunition. Furthermore, they could be broken down into smaller loads so that they fit in the bed of a truck, rather than be towed. This was important as the long journey to Kufra through the rough desert floor would have certainly ruined the artillery before they even fired a shot. When Leclerc was only a few dozen miles south of Kufra, one of the trucks carrying a 75mm mle 1928 broke down and was left behind to be collected later. 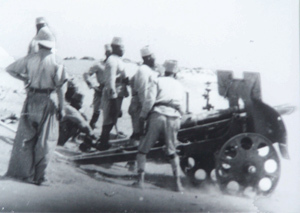 The one remaining 75mm piece played an important role in the siege of Forte el-Tag in Kufra. Leclerc used the light artillery piece to put a few shots into the fort, then relocated it to another spot and fired again. He supplemented the fire with the mortars. 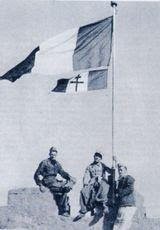 Leclerc carried on this ruse to convince the Italians that he had a much larger force and get them to surrender without having to spend valuable manpower to take the well-defended fort by storm. It worked and the Italians capitulated the fort on 1 March 1941. Later, Leclerc replaced the two mountain artillery pieces with a British 4.5" Howitzer, given to him by the LRDG's Heavy Section. Like the LRDG, Leclerc found the howitzer to be too large to transport, as it had to be towed, and difficult to supply. There is no record of the howitzer ever being used in combat and was most likely abandoned in 1942. The French used the machine-gun as the cornerstone of defense. For Leclerc's troops, it provided cover for them to maneuver. At Kufra the machine-guns kept a watchful eye on Forte el-Tag and suppressed any movement they saw on the ramparts. The guns were also mechanized so they could be attached out to the mobile platoons and reinforce areas of the seige that needed more firepower. 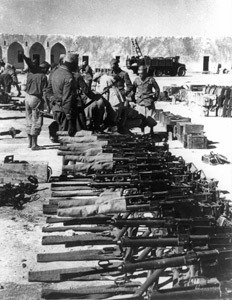 Following the fall of Kufra, the French received a massive amount of Italian heavy machine-guns and ammunition. While the Italian models were inferior, Leclerc wasn't about to let these weapons go to waste. 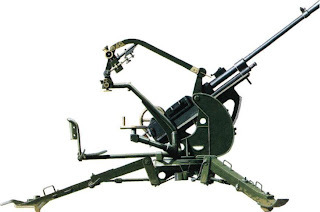 When Leclerc left for Kufra, he did not have any anti-aircraft guns in his arsenal, apart from a few installed in the mobile platoons of the Decouverte de Combat. But when the French column stormed into El Giof (the settlement south of Kufra's fort), they surprised and captured four Autosahariana Lancia RO trucks equipped with 20mm Breda AA guns. Without missing a beat, the French commandeered the guns and integrated them into the column. These guns proved valuable in adding to Leclerc's firepower during the seige. Over the holidays I focused on painting my Tiralleurs. I was able to finish two rifle platoons, an HMG platoon, and an artillery platoon. The inserts. Sorry for the focusing problems! A few weeks ago I finished my Tirailleurs Artillery battery. The 7.5cm GebK15 mountain gun works perfectly for the role and is now available on the Flames Of War Special Order catalog (GSO517). To assemble this platoon I used the FR501 25mm SA-34 Hotchkiss gun platoon. I painted the whole platoon up, guns and all. I also painted two of the 7.5cm GebK15 guns. Then I magnetized the 25mm and 75mm guns so I can swap them out depending on the list I'm planning on running. I'll also be getting some 47/32 guns to magnetize and swap in. I painted the figures and based them, leaving the guns separate. Before adding the spackle, I glued a magnet to the base where I knew the gun would be centered. I painted the guns separately and glued a magnet underneath. A little bit of firepower for my Tirailleurs. Thanks for the great story. Good read. These are some nice painted minis. Love to see a picture of the complete painted force. Great idea of the magnets so you can swap the guns. Something I have to keep in mind. Thanks! I did the same thing with my 15cm and 21cm Nebelwerfers. Wonderfull, now I´m waiting my guns special order to have my artillery platoon on the field. And another fantastic idea, magnets to swap the guns, since I want use all the french forces in BE, that can be a great help to morph the lists. After reading the post, now I think that I will use the Lancias RSOs for the AA platoon with Bredas on trucks.